digital video, color, sound, 4 minutes. Historical banners (ca. 1841) at the Maine Historical Society. He that will not pay the SHOE-MAKER is not worthy of a SOLE. 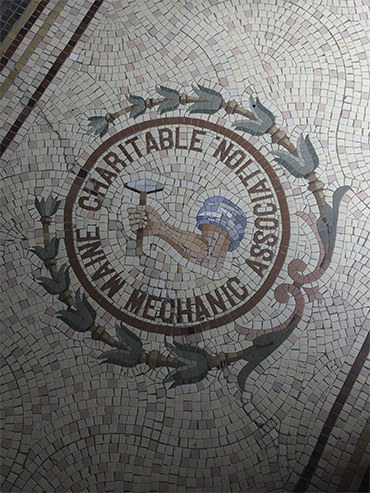 Tiled entry to the Maine Charitable Mechanic Association. All Hands On Banner Project documents Ellen Babcock's artwork/event of the same name, a project that endeavored to weave historical signage and parade practice with contemporary concerns in art and labor. 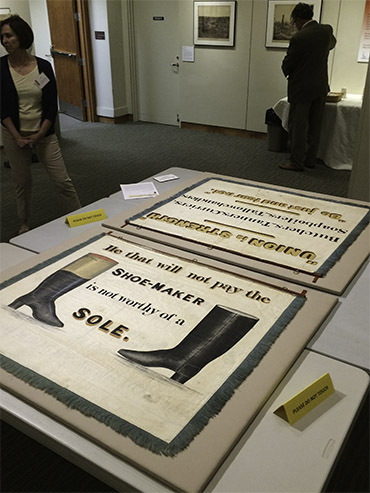 Ellen collaborated, over an extended period of time, with trades- and craftspeople, students, artisans, and under-recognized laborers in Portland, Maine, to design images and slogans for thirteen hand painted banners. In contrast with the 36" x 42" silk banners from 1841 – written about by her father, labor historian Robert H. Babcock – her banners were larger (45" x 60"), on canvas, carried by pairs of marchers, and linked by ribbons. The parade was held on 2 Sep 2016, the Portland First Friday Art Walk nearest Labor Day. seem terribly prophetic, resonant, relevant. I only know this Billy Bragg song because the superb English trio, The Young'uns, recorded it on Another Man's Ground, their album from 2015. Find below two versions of the song, the first, unadorned but with raucous introduction, the second in a gorgeous setting and having higher production values.